I'm curious...what's your stance when it comes to kids and vegetables? Do you fall in the 'hide veggies in their food so they don't realize they're eating them' camp, or the 'kids must eat their vegetables, whether their like it or not' camp? I don't necessarily have a strong opinion one way or another, in part because I don't have to worry about feeding any children vegetables yet! That being said, I'm interested to hear your thoughts...do share! Regardless of where you fall in that debate, it's a non-issue with this recipe, which happens to do both. 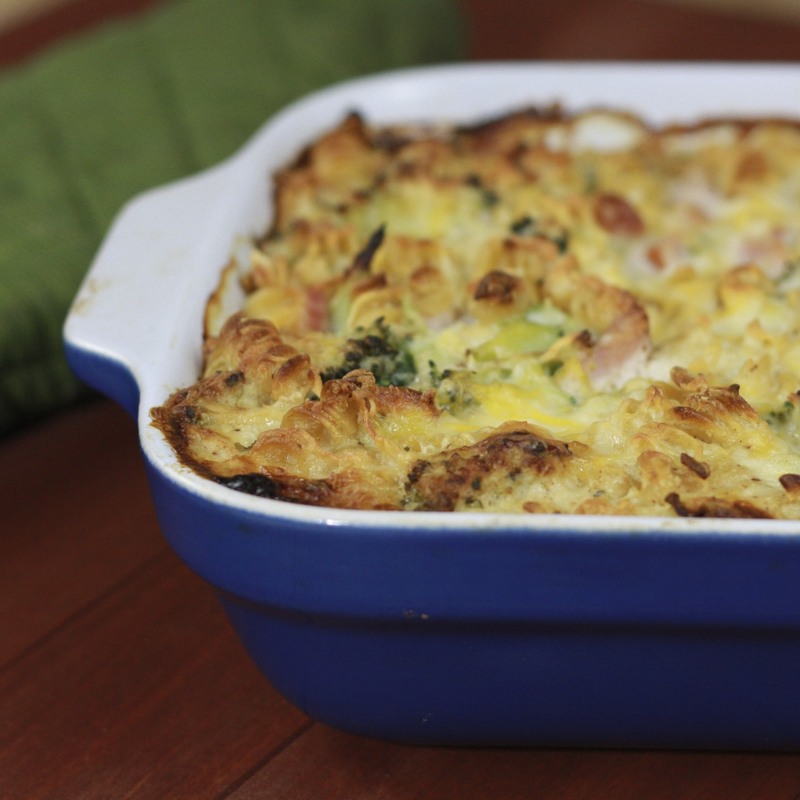 A recent Martha Stewart Living issue featured this recipe and since I had some leftover ham from the hot ham and cheese sandwiches, it caught my eye. 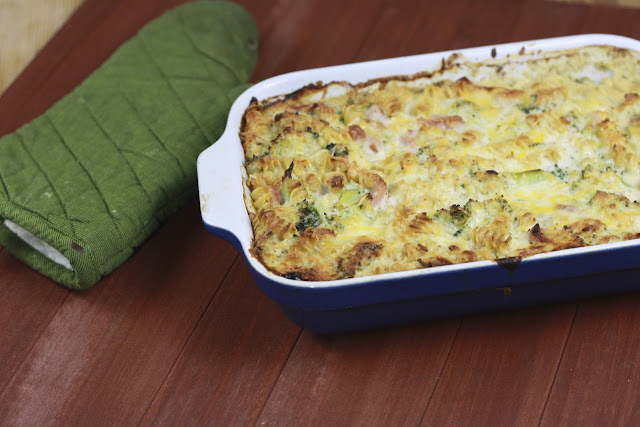 With cauliflower blended into the cheese sauce and broccoli mixed in with the pasta and ham mixture, it manages to both hide and display its vegetables. Skeptics probably question the cauliflower sauce and I will warn you, it's apparent that the sauce isn't just cheese and milk. Ryan noticed something was up but couldn't put his finger on the cauliflower until I pointed it out. I used swiss cheese that I had instead of pecorino which may have altered the flavor slightly. In the end it was still a cheesy pasta casserole that provided a double dose of vegetables...can't go wrong with that! 1. Heat oil in a medium saucepan over medium head. Add cauliflower, garlic, onion, and 1/2 tsp salt. Cook until soft (approximately 10 minutes), stirring occasionally. Add flour and stir to coat well. 2. Gradually add milk, stirring, and bring to a boil. Reduce heat and simmer until cauliflower is soft (about 15 minutes). Allow to cool for 5 minutes. Transfer to a blender (or use an immserion blender) and puree with nutmeg and 1 cup swiss cheese until smooth. 3. Cook pasta in boiling water until slightly tender but not fully cooked (about 5 minutes). Drain and return to pot. Add ham, broccoli, and cauliflower sauce, stirring to combine. Transfer to an ovenproof baking dish and sprinkle with remaining cheese. 4. If baking immediately, bake at 400F for 30 minutes. Broil for 1-2 minutes just before serving. Top with panko, if desired. If freezing, wrap well and freeze until ready to bake. Remove from freezer and allow to sit at room temperature while oven preheats. Bake at 400F until cooked through, about 45 minutes.